I think we may have left the best to last. This trek to the Campo de Hielo Sur or the Southern Icefield is a wild and remote adventure that has a bit of everything and all starting out of El Chalten. It has everything climbing a peak on hard snow with stunning views over Cerro Torre and Mt Fitzroy. Descending off the beaten path through a wild twisted stunted Patagonian forest. A relaxing walk along a huge wild valley. A campsite next to a scenic lake. A river crossing using a Tyrolean Traverse (single wire over a canyon a harness is essential! ), followed by a scramble up a ravine and a huge loose moraine. A long ice trek across a glacier. Then a traverse across a steep slope above some dicey cliffs and a final climb to the most spectacular view over the vast ice field. Oh and then a long walk home! We were staying in the Ranchero Grande in El Chalten it was pretty nice place to stay as we paid for a dorm room despite no one else being their. The Lonely Planet describe it as a Backpacker factory but when everywhere is closed and the winter wind is howling I quite liked the snug wooden charm of it. The also looked after our spare kit as we set off on our final hike. We had to sign out with the admin office due to the remoteness and difficulty of the hike, only one other group were in the whole park at the same time! Below is the view across to Mt Fitzroy. it was taken just after sunrise as we headed away from the park office and El Chalten. The spiky ridge looks like some kind of dinosaur lurking behind, with just its spines showing! After a long flatish stretch of path we started to gain height quickly through the forest and we soon reached the snow line. It had snowed lightly overnight, but it started to burn off as soon as the viciously strong Patagonia sun shone. The UV rays down here can’t be taken lightly they are literally deadly strong and all because we wanted cheap fridges in the 1980’s with CFC’s in. We approached the open and icy flanks of Lomo del Pliegue Tumbado, this is the peak with superb views we were aiming for. The climb to the summit required crampons due to the hard snow pack on the final slopes but it was never too steep. Soon we were sat on the cairn at the top. The view from the peak was more than worth the slog, it is without doubt the most stunning vantage point we visited. You have sweeping views over Cerro Torre, Lago Torre and the glacier, then to the right is a view towards Mt Fitzroy as it stands proud. I can’t recommend this hike enough. It is to me, more impressive than Lago de Tres or lago Torre. Although it was just part of our much longer trek, it is worthwhile as a day trip for those on shorter time frames. 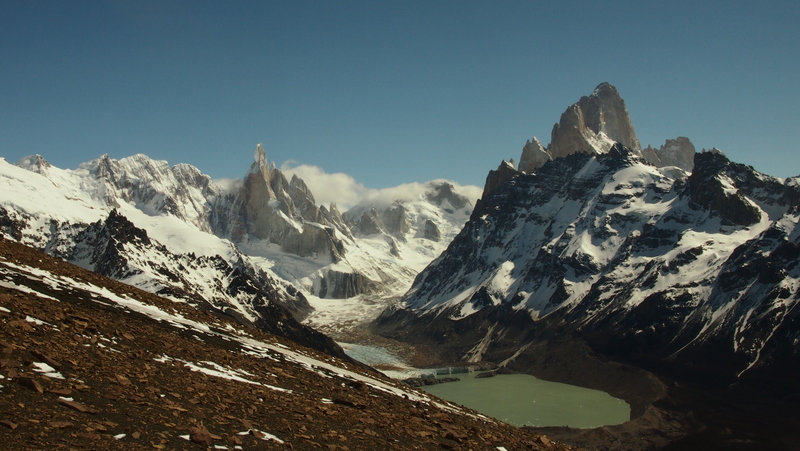 The shot below shows the full panoramic with Fitzroy and lago Torre, breathtaking is probably overused as a travel descriptive, but here it seems fully deserved. You just want to sit down and contemplate this thought ‘is there a better mountain view within the whole continent?’. This certainly was one of those moments when you realise you are living life as you intended and there is no where you would rather be. From the peak we went off trail and headed down the snow towards the Rio Tunel valley, we bush bashed in the red coloured bonsai trees intricately shaped by the wind, just managing to find a way down marked out by a small stream. The picture below is lower down en route to the valley. In the distance you can see the glacier at the head of the valley and in front the lake where would camp for the night. The valley was very pleasant and reminded us a bit of New Zealand, we thought this would probably be a ‘Great Walk’ and be overcrowded with huts and trampers if it had fallen into that particular country! In Patagonia it is just another spectacular area that is too far from the town for most people to bother with. Rio Tunel? I wonder why the river is called that we asked? Then we saw the glacier that feeds it…. yep that’s a tunnel alright. To give you a scale a huge bus could drive into the entrance. The ice was so dirty from years of retreat and melting that the high contrast picture today makes it look almost menacing. Next up on the hike that has everything, was the Tyrolean Traverse, what’s that? I hear you ask. It is basically a cable strung high above a deep rocky ravine that acts like a bridge in the loosest sense. You have to clip a harness onto the cable then pull yourself along. Sounds easy, well maybe, if it wasn’t up hill and the carabiner didn’t stick on the metal cable and a heavy backpack wasn’t fighting against you. After much faffing I took the plunge and trusted this random cable with my life. It was OK, tough on the hands but fine. Just don’t look done I shouted to Marion as the river crashed about in the white water far below. In an ingenious plan because we only had one carabiner, it had to be attached to some string then Marion could pull it back across the cable and use it as well. A great plan until we realised that the string was very weak and if it snapped, Marion was stranded on the other side!The picture shows Marion mid traverse. After the river crossing we started the glacier trek. The scramble onto the ice was a bit steep but the melting had left exposed rocks that provided grip, so crampons weren’t needed. The glacier, as the park warden told us was not crevased for the middle section so it was relatively safe. We were then soon high up above it, with the view looking back to the white and blue ice below. We were now approaching the main attraction, the view to the Icefield was hotly anticipated, I was nervous it wouldn’t live up to expectation. The pessimist is never disappointed is my normal motto, but today I had high hopes. The weather as expected was getting cloudier as we progressed west, however visibility was still good on the whole. The Southern Icefield is the largest in S America, at over 350km long. It forms by the continuous weather rolling in off the Pacific ocean, this rising up the mountains precipitates snow metre after metre to create the huge ice flow. The ice encapsulates entire mountains where some form nunataks like isolated tropical islands rising from the sea of ice. There are two active volcanoes part buried in the icefield which is pretty crazy and would lead to some interesting times if they erupt! The picture below is part of the full panoramic that greeted us. So this was it, a huge vastness of ice expanding as far as the eye could see, a spectacle unmatched in most regions of the world. It was worth the hike on it’s own but in this case the interesting and varied journey made the trip a complete package. So Click click on the camera, sit, relax, eat lunch and soak it all up, but sadly not too long, the Patagonian winter wind was chilling us to the bone and we had a mountain to descend, glacier to cross, sketchy river wire crossing and a few kms of lake edge hiking before we reached the tent tonight. Below is down climbing a stunning canyon of striped rock as we progressed back towards the lake. The next day we hiked out, we had wild camped in the wide valley as the campsite was a bit grim, bare earth with bits of broken glass and tarps pulled over some make shift shelters. This is the camp spot hikers and mountaineers stay ain, while waiting for the weather and hoping for a traverse on the icefield. It can take days for the weather window to arrive so drinking by the fire and pacing the campground, sheltering from the wind and weather seemed to be the order of the day guessing by the debris. This is the view back up the valley early on the final morning. Not a bad way to start the day. As we got closer to town we saw the first people in 3 days and the view below against the bright blue skies. This was to be the last hike of the trip. We returned our rented tent and harnesses, signed back in at the park office. Packed our stuff and caught the bus back to El Calafate. This was the start of our week-long journey back to the UK, the tediousness of travel!